Italy is often considered quite an expensive place to visit, but there are plenty of free fun things to do if you know where to look! Casino Venier is an 18th-century casino over the Barateri Canal high society would drink, dance, flirt and gamble. Today you can enter for free and take in the sheer opulence that its decor still exudes. I Gesuiti is a Baroque church with free entry, which also houses grand pieces of artwork and sculptures by Titian and Tintoretto. Orsoni Color Library is a working glass furnace that has provided materials for St Paul's Cathedral and the Sacre Coeur. You can call ahead to get a free tour of the workshop and visit the magical color library.Basilica di San Marco is a must-see sight that will cost you nothing too. It's fairytale facade overlooks the Piazza San Marco and you can take a look around the amazing mosaics in its domed interior. No trip to Italy is complete without gaining a few pounds! For the best culinary experience, you should head to where the locals eat. If you're hungry for a pizza, Rossopomodoro near St Mark's Square serves some of the best in town. If you're looking try more authentic Venetian dishes (vermicelli with black squid ink, traditional rice and pea soup) make your way to Osteria di Santa Marina in Castello or Alla Palanca in Giudecca. More intimate eateries, where you can mix with the locals over huge wine menus, include Al Merca, housing over 50 types of wine and Prosecco that is served with delicious but simple deli dishes. Image by Kosala Bandara used under the Creative Commons License. 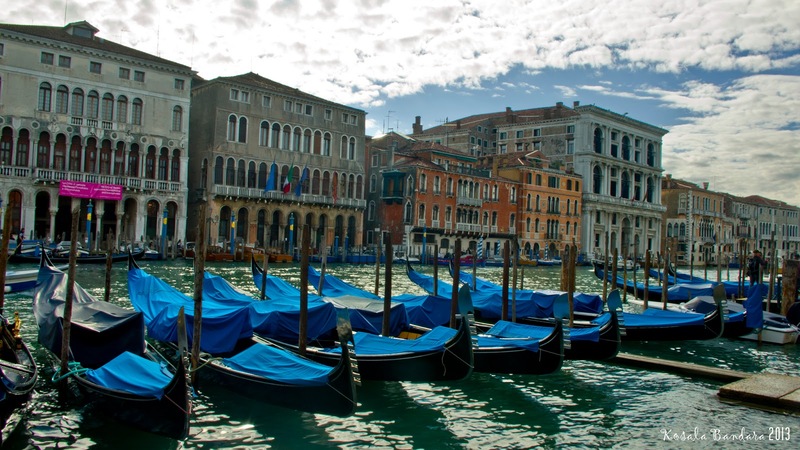 There are a number of things that you have to do in Venice to make the most of your stay. Start at the piazza San Marco to see three incredible landmarks: Basilica di San Marco, Doge’s Palace and Torre dell’Orologio. It's then mandatory to take a gondola ride. Take a look at the Istituzione per la Conservazione Della Gondola e Tutela del Gondoliere website to be advised on the best routes Lathat will give you the best scenes of the city.Grand Canal should definitely be on your list, as it is the historical canal that has helped the city with its trade.To get the very best views of the city, make your way to the top of Campanile, the tallest building in Venice. Finish off a perfect trip by taking in an opera or concert at La Fenice, an opera house that will make you feel like royalty. Whether you're on a budget or looking to really splash out, any holiday to Venice is nothing short of magical. I might also suggest a free tour of Murano Glass. You may suggest the tour. :-) It sounds like an interesting one and if it is free, it is all that much better. Amazing how many free things there is to see and do if you just look for them. You are totally right George, lots of options out there. Another of your great header pictures! Carrie and I visited Italy for two weeks before she had to be in Copenhagen to do some studying. We LOVED Venice. We didn't think it was expensive at all when we were there in 2006. Absolutely lovely. So happy to hear that you loved Venice. I don't think there are many people that have visited Venice that don't like it. I wonder how much the prices have changed since 2006?! We have been to Venice twice. It be as cheap or expensive as you like. it really is no different than other major cities for pricing. The second time we went off the main routes and walked all the back ways and had such a wonderful time. Walked where all the locals live and their laundry hanging out. A very different side of Venice. We loved the produce boats that the locals shop off of. As far as the gondola ride, go at about 7:00, you get a great tour and also have the Grand Canal to yourself. Go later and the wind has picked up and the rocking and rolling has caused the tourists to be seasick! Lucky you, to have been to Venice twice! :-) You are totally right about making it as cheap or expensive as you like, also everyone has a different opinion of what cheap or expensive is but either way you look at it, Venice is a beautiful city to visit. I like they way you explored the city the second time, that is the way Kevin and I like to do things too. Thanks for your suggestions on the different ways to see the city and your little tip about going out in the gondolas.